Rolling onto the Supertest today is the French tier VII wheeled armoured car, the Hotchkiss EBR. We’re going to assess the statistical balance and continue battle-testing the new game mechanics. When we’re through, we’ll decide on the release set of game mechanics and the finalization of the entire wheeled vehicle mini-branch. The Hotchkiss EBR is a ‘transitional’ vehicle introducing the players to the peculiar gameplay of top-tier wheeled armoured cars. It lacks the two driving modes like them, but it does have the Charge ability and the special lock-on feature. It also has an auto-reloading 75-mm gun. The dynamics and manoeuvrability of the Hotchkiss EBR are lower than those of the tier VIII–X vehicles. Additionally, the absence of the Drive (fast) results in a lesser top speed. 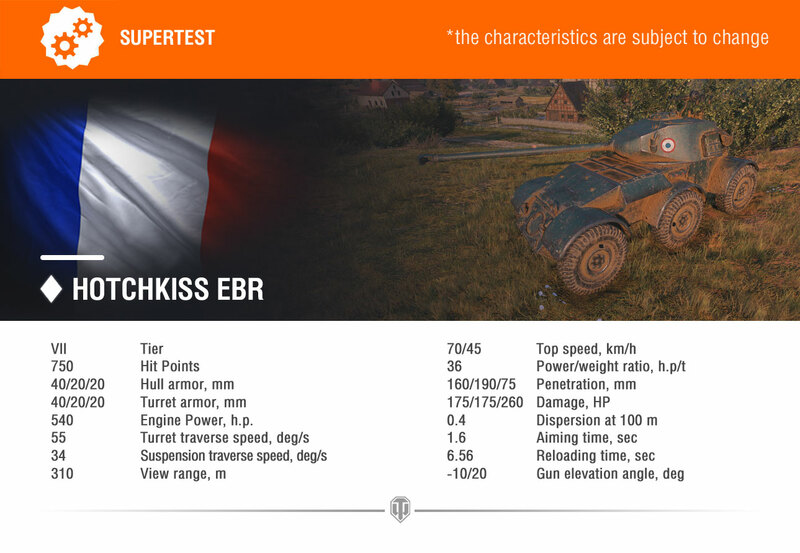 Depending on test results, the stats of the Hotchkiss EBR may change. Follow the news and all the luck in your battles! Thanks, once again, this is NOT trolling. The gun is interesting, so there’s that. But if anything that only makes it more likely that this will be played more like a TD and less like a scout. The meta as a whole has done all in its power to make both passive and active scouting as irrelevant as possible. this little dude looks like a keeper! 70kph top and huge P/W with the new boost mechanic? ?